bolt strikes the backplate, the velocity with which the bolt strikes will be the sum of the bolt velocity measured with respect to the cradle and the forward velocity possessed by the gun at the instant of impact. It also should be realized that motion of the gun in the cradle affects the distance through which the bolt must move with respect to the cradle in order to establish the bolt opening required to permit feeding. The opposite situation is encountered wrhen the barrel spring and buffer do not stop the recoil motion of the gun until after the bolt strikes the backplate. In this case, the gun is still moving back at the instant of contact and the impact velocity is the difference between the velocity of the bolt measured with respect to the cradle and the rearward velocity possessed by the gun at the instant of impact. Here again, proper allowance must be made for the fact that the motion of the gun in the cradle affects the distance through which the bolt must move with respect to the cradle. The velocities and movements involved in the preceding timing arrangements would not cause any particular difficulty if the conditions of motion remained the same from shot to shot. However, under practical conditions, some variation in the recoil motion is unavoidable and therefore the relative velocity with which the bolt strikes the back-plate will not remain constant and the position of the parts at the instant of impact will also vary. In a high-rate-of-fire gun, each cycle of operation has some effect on the following cycle and under the conditions of timing described above there is a strong tendency for any variation to produce even greater variations. This will cause the gun to quickly ''fall out of step", with the associated symptoms of stuttering and extremely erratic action. 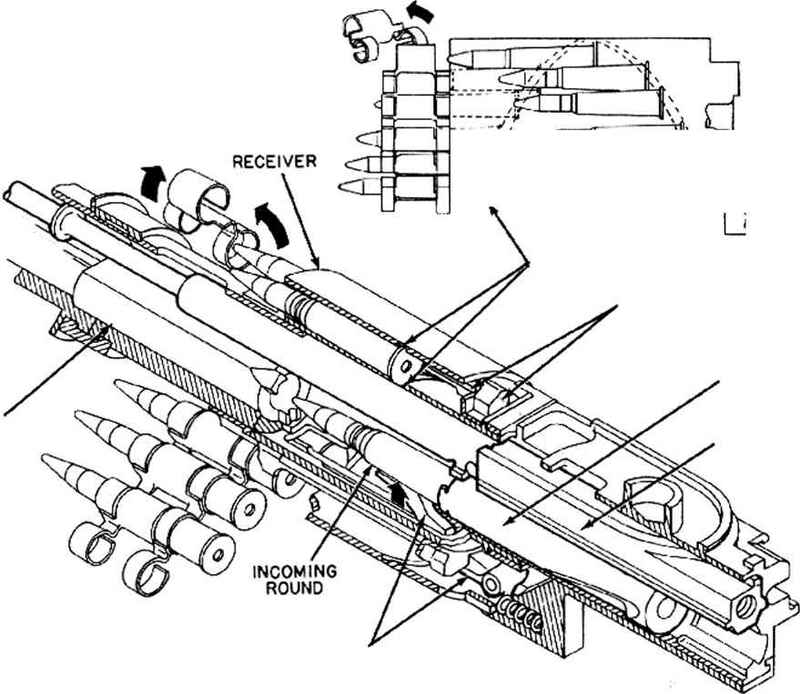 With the gun operating in this manner, the parts can be subjected to abnormally heavy shocks and excessive parts breakage is certain to result. A way to avoid malfunctions resulting from variations in the gun recoil movement would be to set up the timing so that the bolt strikes the back-plate just at the same instant the recoil motion of the gun is reversed. If this could be arranged, the impact would occur while the gun is not moving and is at a definite position, with the result that the variations described in the preceding paragraph could have no effect. Unfortunately, when an ordinary ring spring buffer is used, it happens that this timing arrangement causes an even more critical condition to exist. With a ring spring type buffer, the velocity of the gun is reduced rapidly to zero and then the action of the compressed buffer immediately drives the gun forward, although with reduced velocity because of the fact, that the buffer absorbs a considerable portion of the recoil kinetic energy'. Fig. 3-15 is a graphical representation of how the gun velocity varies with respect to time during the action of the buffer. Note that on either side of the instant at which the velocity is zero, the velocity is changing quite rapidly. From this curve, it is evident that even a very slight variation in the instant that the bolt strikes the backplate can have a very great cffect on the relative velocity of impact. It appears, then, that if the timing is such that the bolt strikes the backplate during the action of a ring spring buffer, the tendency toward erratic performances is especially pronounced. The difficulty described above can be avoided bv modifying the characteristics of the buffer. The major cause of the trouble is that the ring spring buffer has the steep time-velocity characteristic shown by fig. 3-15. if the buffer is designed to act over a greater interval of time, some improvement will be gained bccausc the change in velocity with respect to time will then not be so abrupt. However, the best results will be obtained if the time-velocity characteristic of the buffer is as shown in fig. 3-16. One way to obtain this type of action is with a hydraulic buffer designed so that its resistance is proportional to the gun velocity, thus producing a viscous damping effect. The slight step in the curve of fig. 3-10 immediately adjacent to the point of zero velocity, is due to the fact that the buffer action terminates in such a manner as to provide the effect of a fixed positive stop. Note that for a considerable interval on either side of the instant of zerp velocity, the velocity is nearly zero and changes very slowly. Hence, even if the instant of bolt impact varies slightly over this interval, there will still be very little change in the relative impact velocity. The effect of using this type of buffer is to cause a hesitation wrhich stops the gun and backplate at the same place for each shot and which maintains the gun velocity very close to zero for an adequate time interval. This effect is equivalent to providing the gun with a fixed receiver, thus permitting the conditions of the boh impact to be kept under precise control.